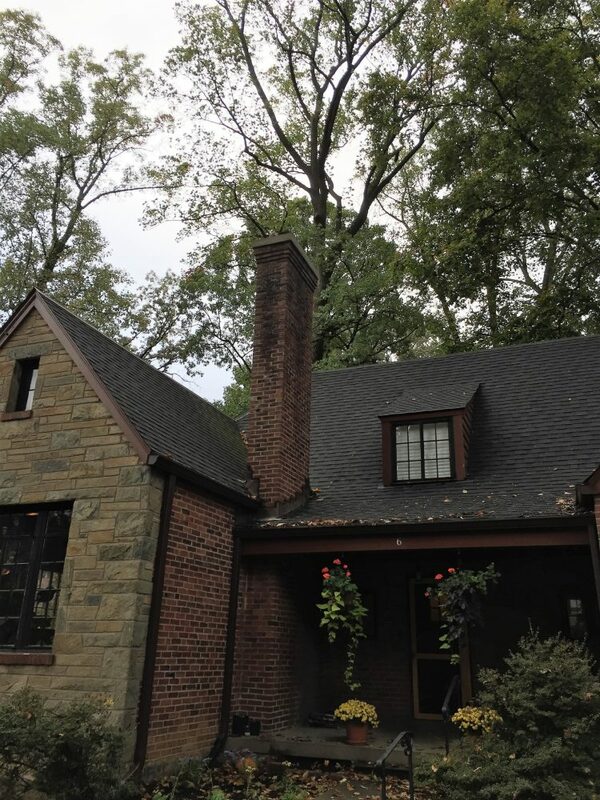 This Potomac, MD home had a chimney that was leaking. 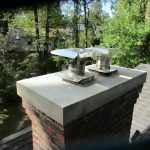 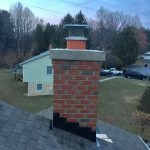 Our chimney repair technicians installed 2 cast crowns and large chimney caps. 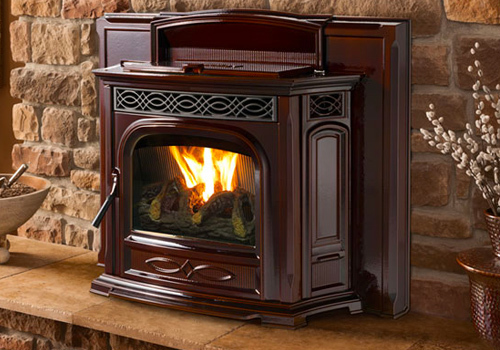 Visit our Potomac, MD fireplace page to learn more. 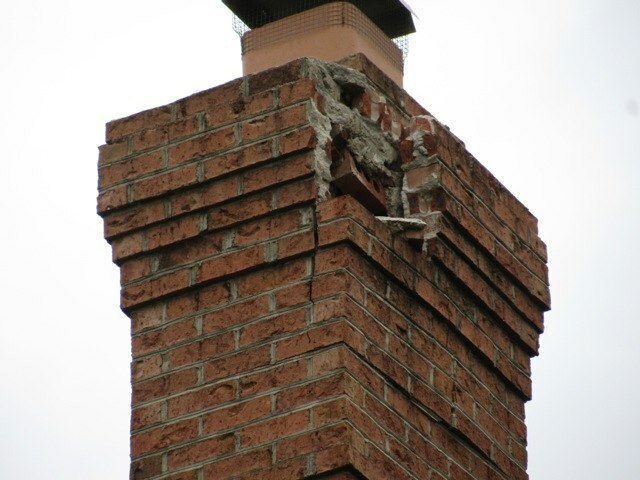 The bricks in this chimney on a home in Greenbelt, MD were crumbling and spalled due to water damage. 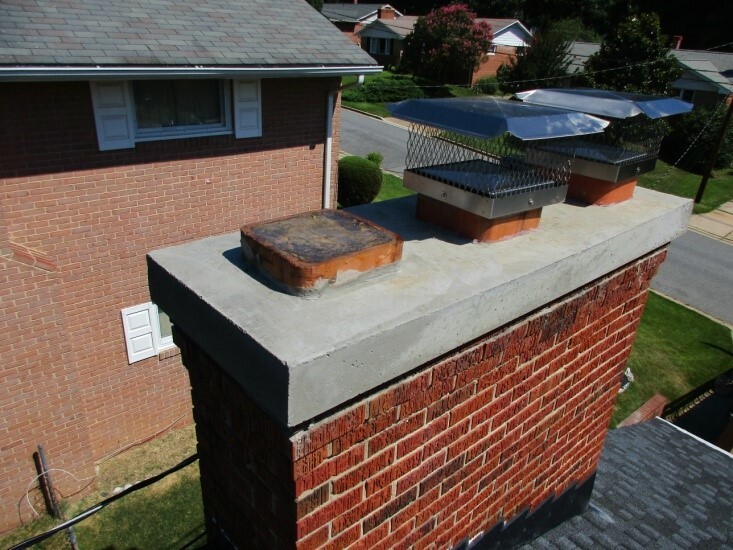 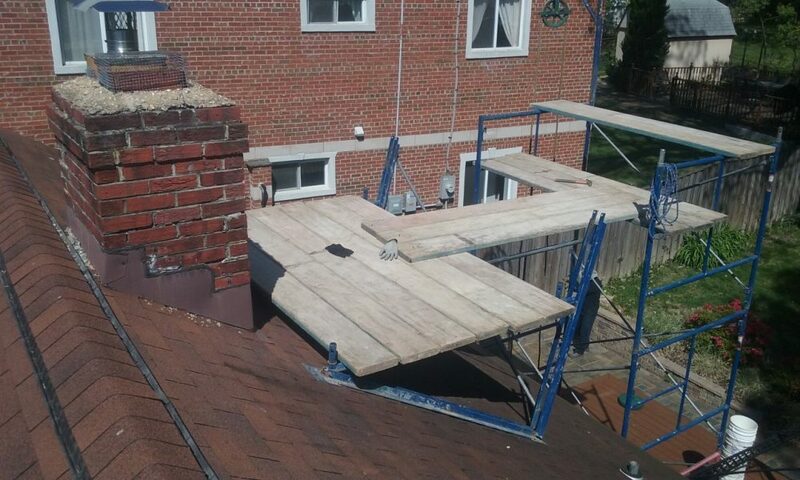 As a result, our chimney repair team completely rebuilt the chimney from the ground up. 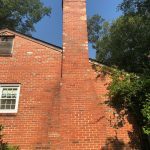 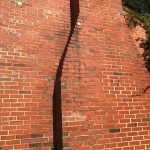 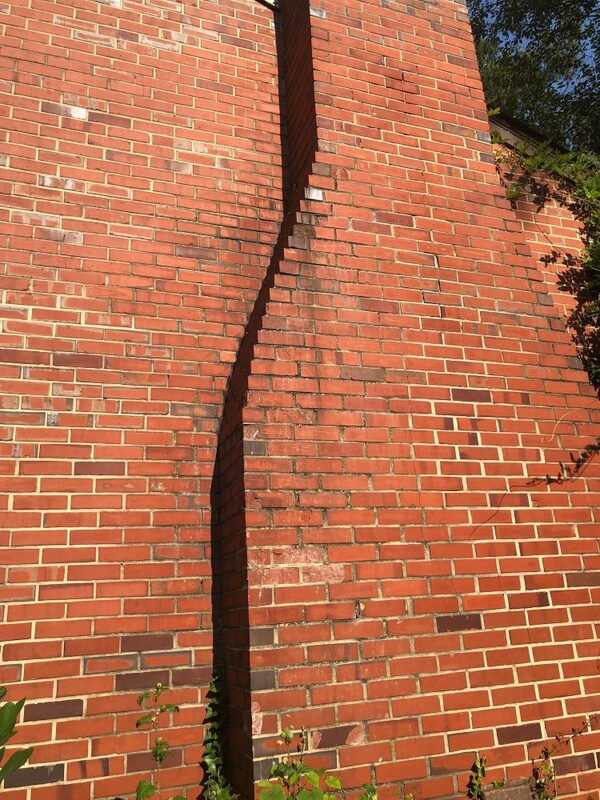 Deteriorating mortar joints were causing the chimney to lean on this home in Washington DC. 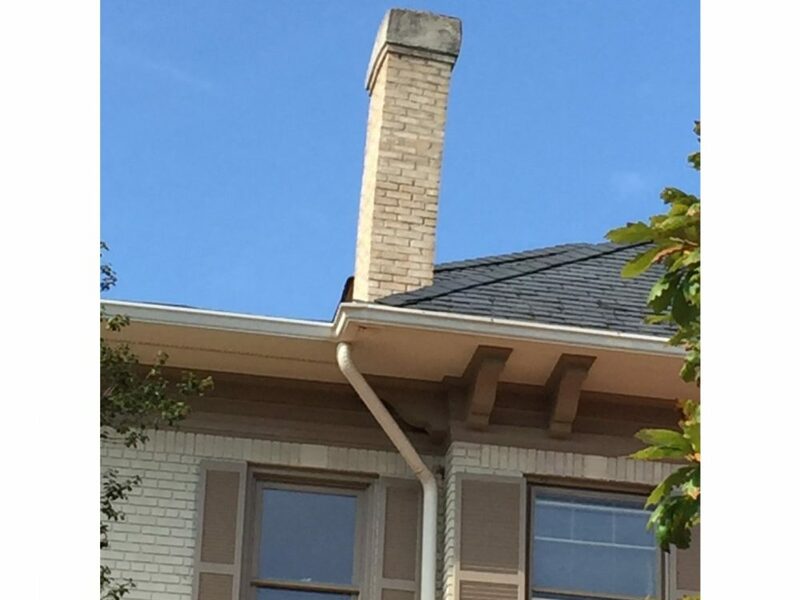 Yes, the chimney was leaning. 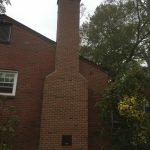 During the inspection, it was determined that the house needed a chimney rebuild and new liner installed. 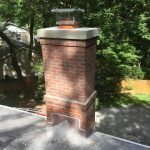 Be sure to read this detailed articlewith step by step photos of this project. 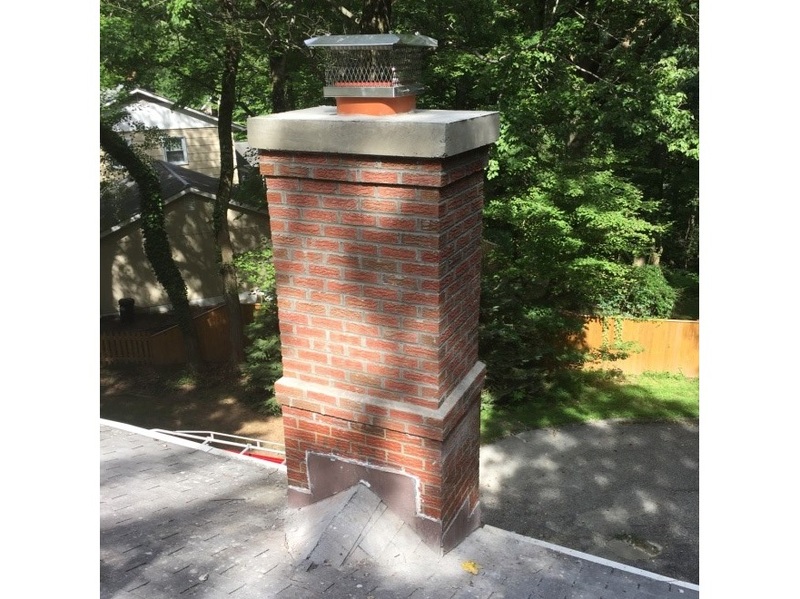 The homeowner contacted us to rebuild their chimney and install a gas insert. 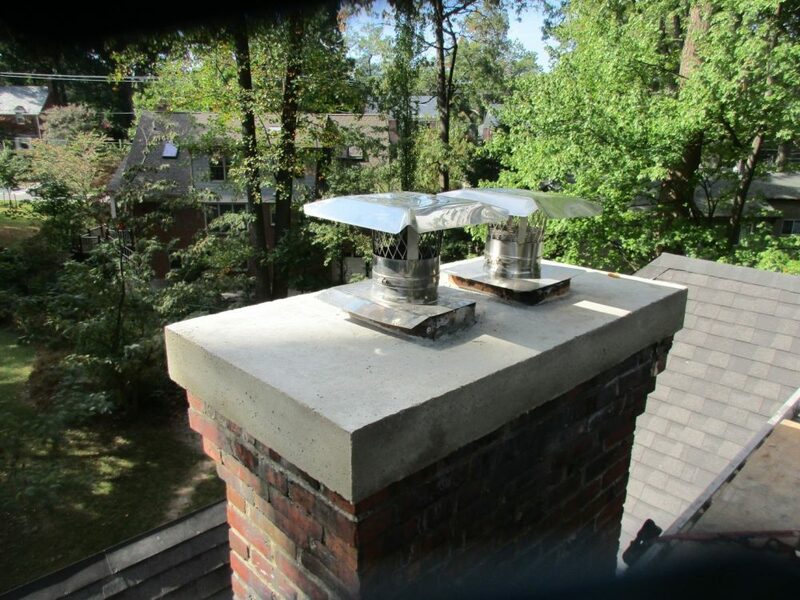 Their chimney crown was leaking resulting in damage to the home and chimney bricks. 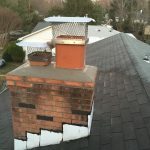 Chimney repair job completed in Silver Spring, MD. 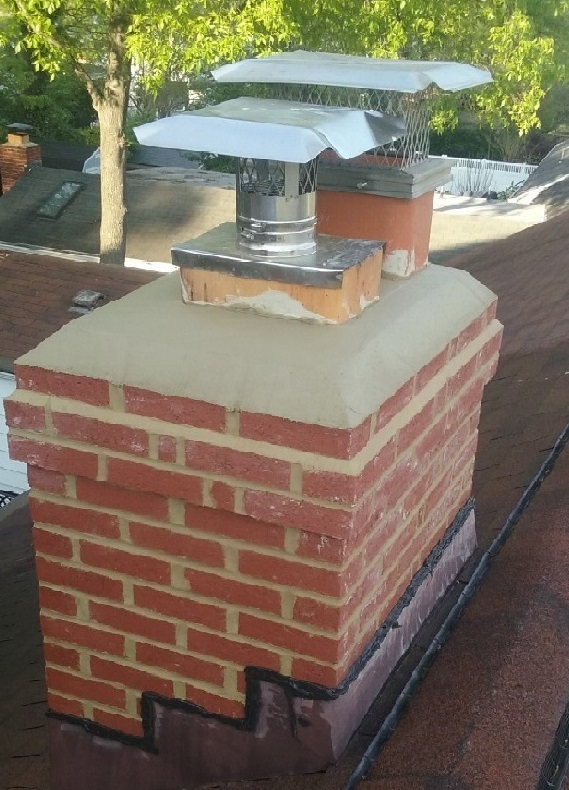 Installed a new floating cast chimney crown. 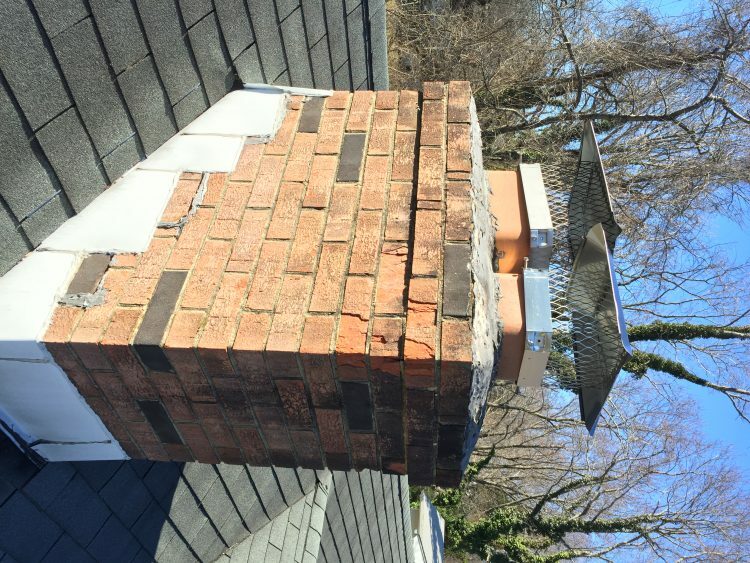 This is a recent chimney repair projet in Ellicott City. 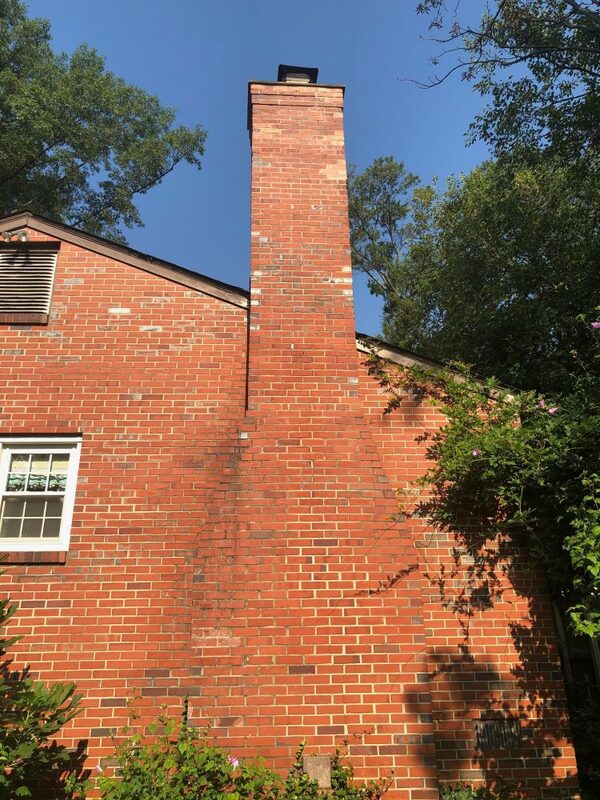 The homeowner contacted us because his chimney needed to be fixed. 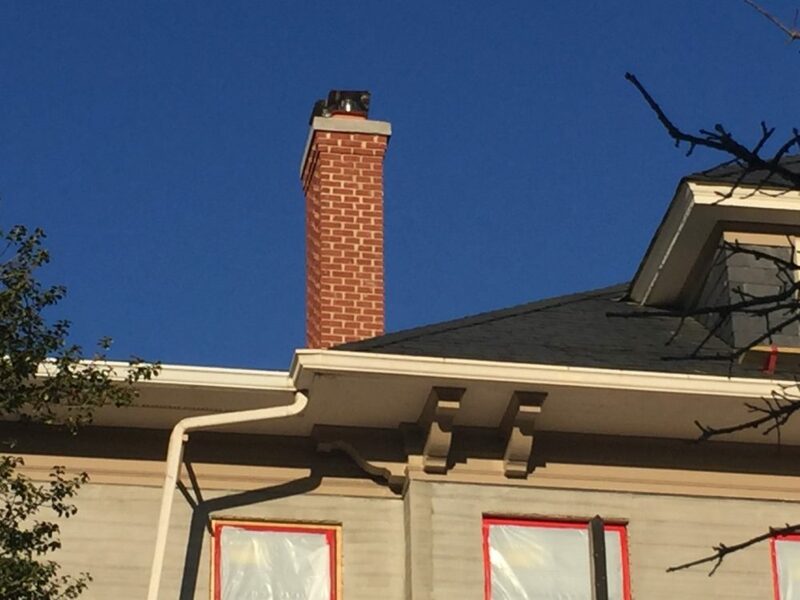 As you can see the bricks on the chimney are spalling (when the faces of the bricks pop out) and cracked. 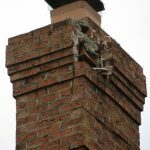 The previous homeowner made some attempts to patch up the chimney, but it did not go to well. 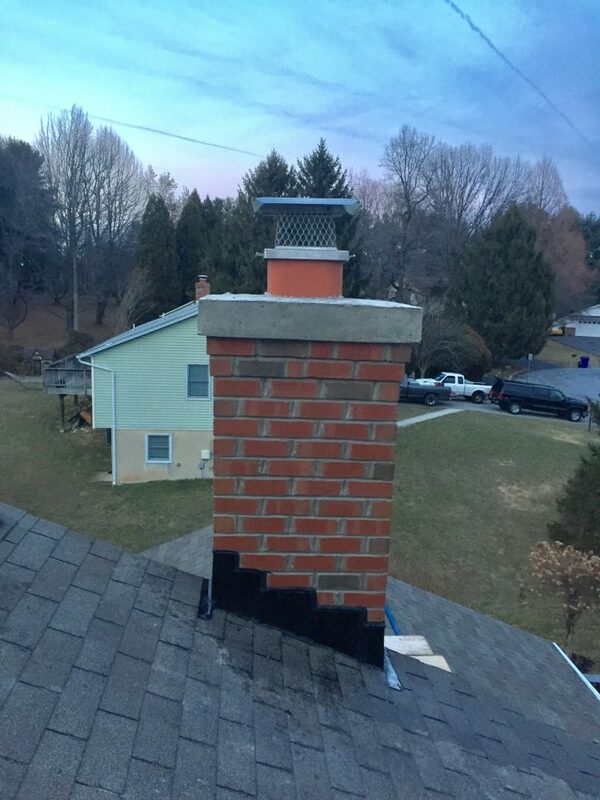 We rebuilt the chimney from the roof line up. 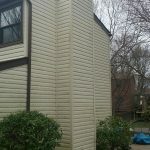 The homeowner had received 3 other estimates with various recommendations. 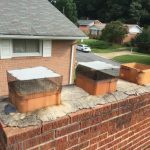 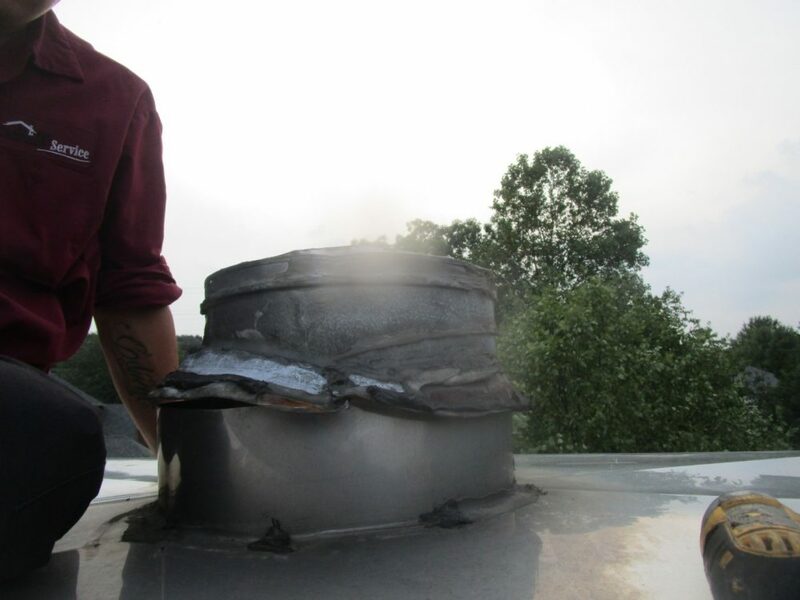 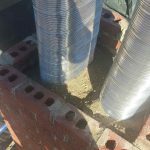 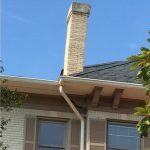 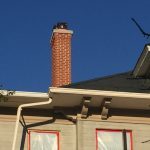 After our inspection, we discovered multiple problems that resulted in the need to rebuild the chimney system completely.Read how we did it. 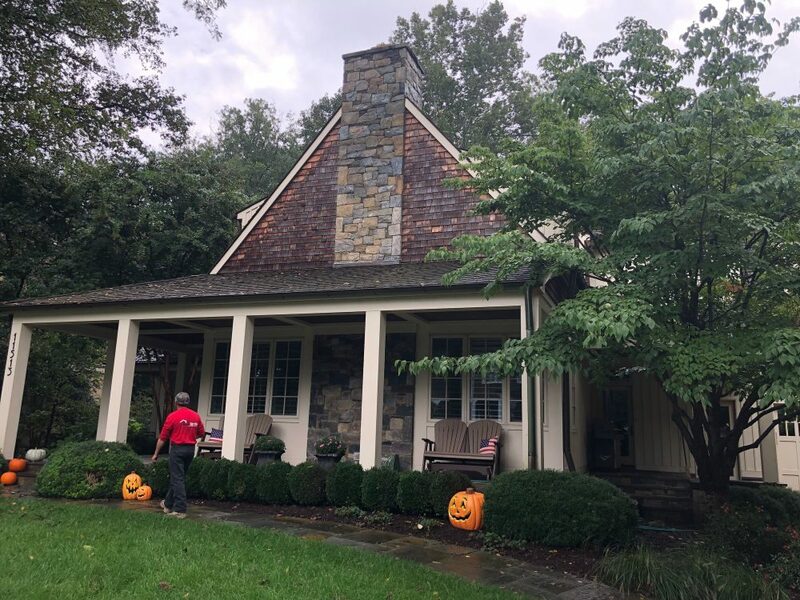 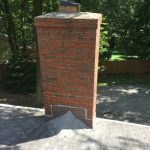 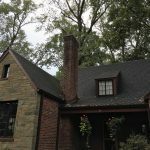 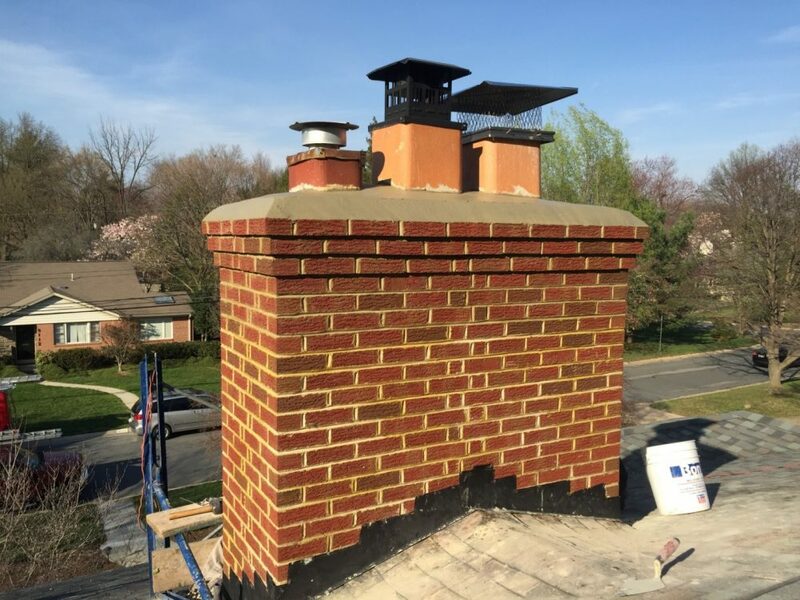 This chimney in Silver Spring, Maryland was in need of a rebuild because the mortar joints and bricks on the chimney were loose and deteriorated. 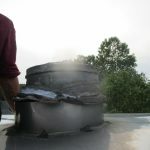 The customer previously hired another company to repair their chimney in Potomac, MD but their chimney still leaked. 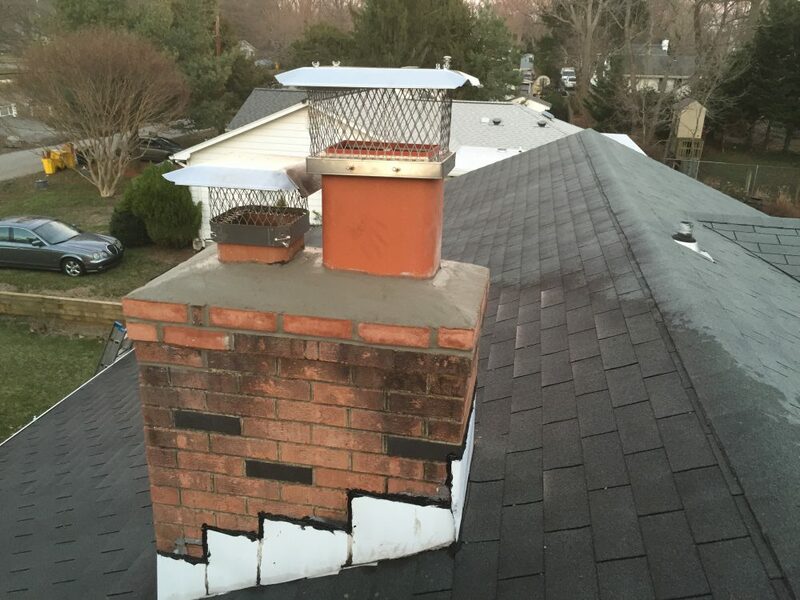 We fixed the problem by replacing the chimney cover and chimney cap. 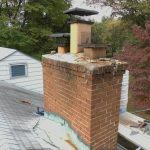 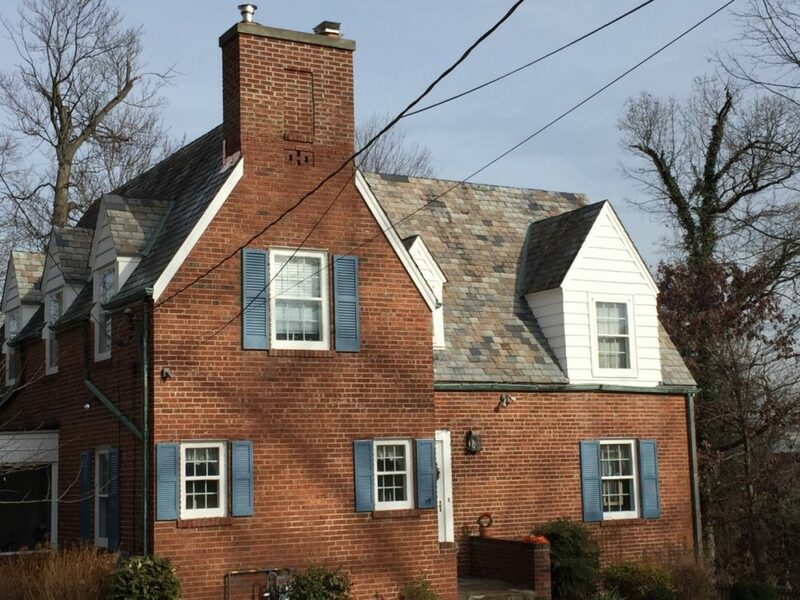 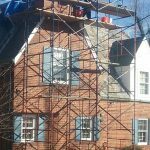 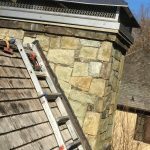 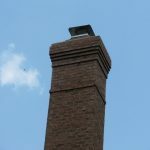 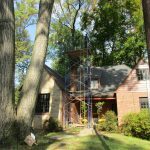 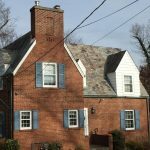 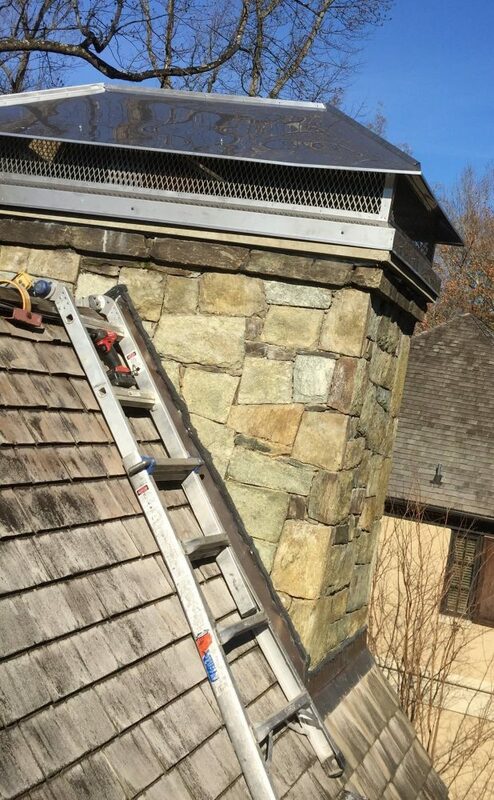 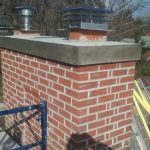 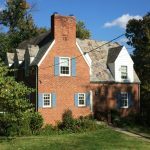 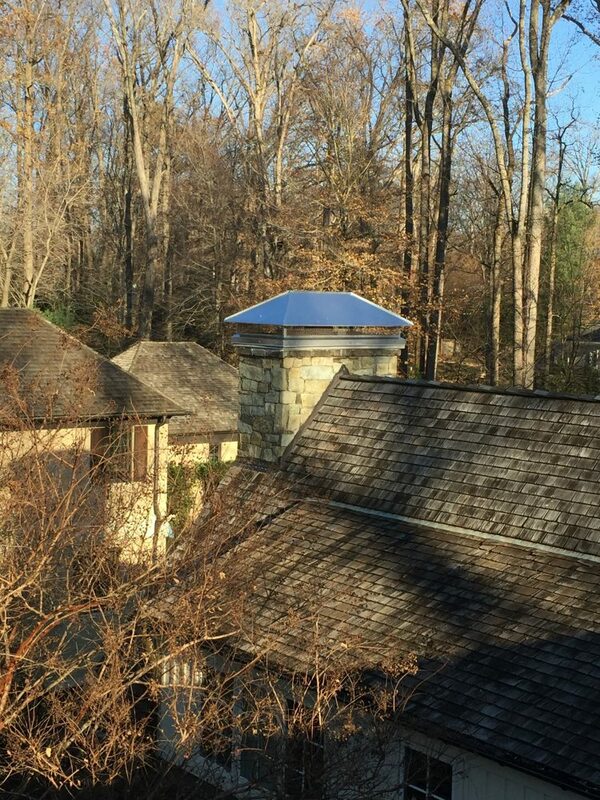 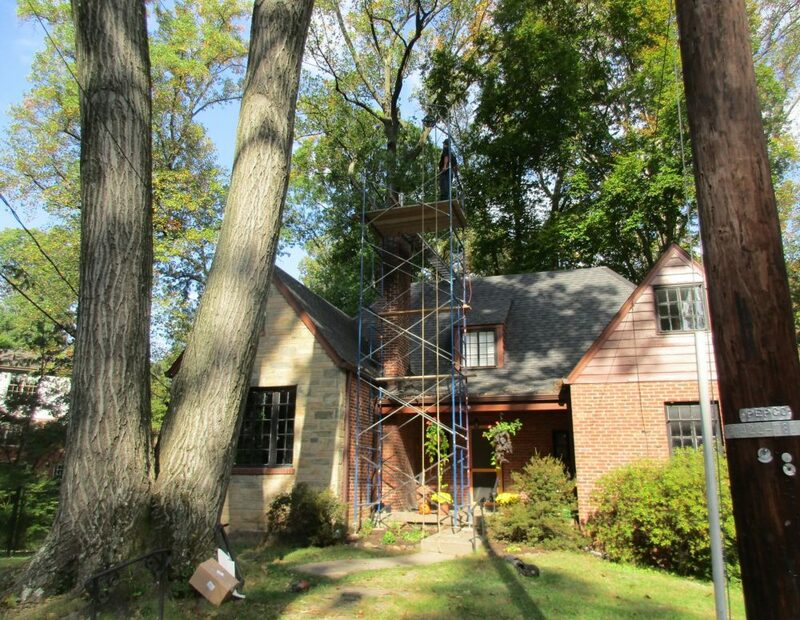 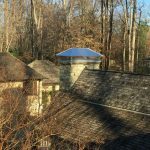 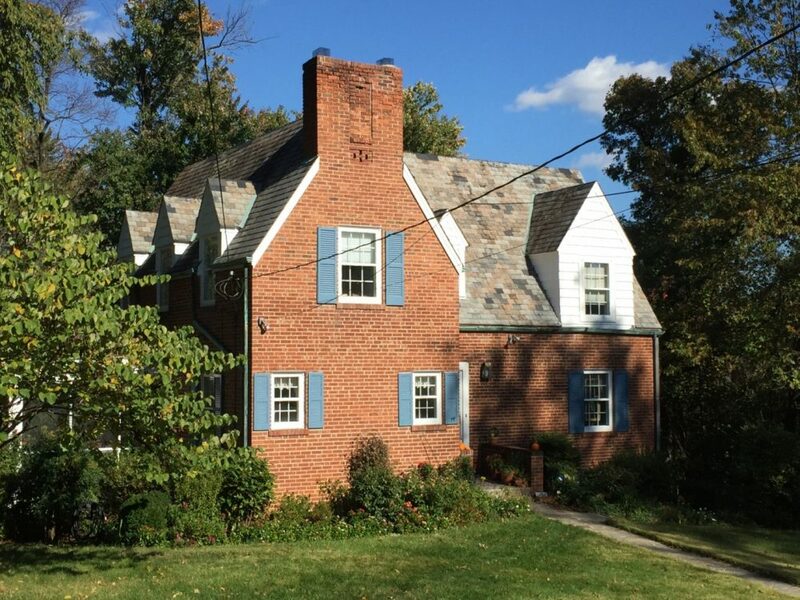 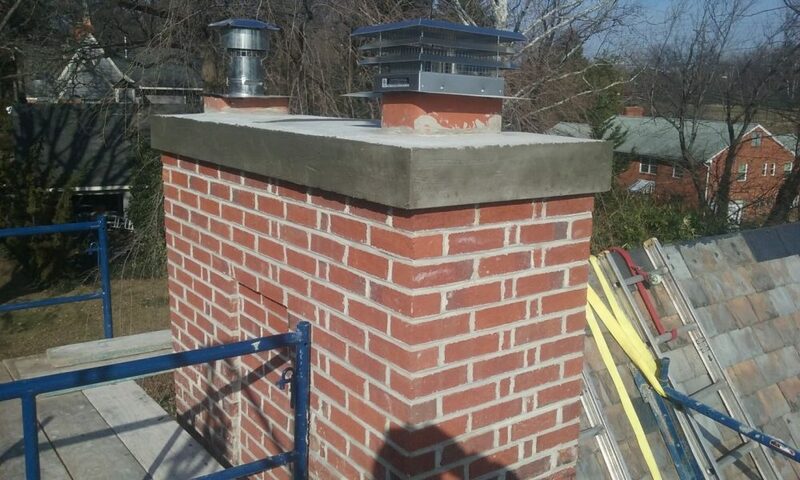 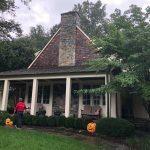 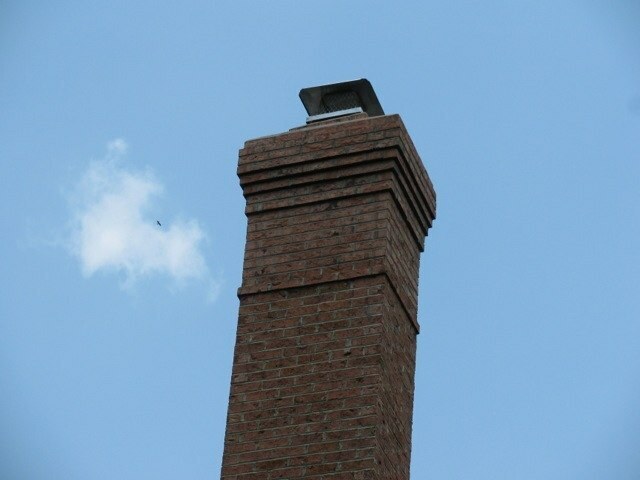 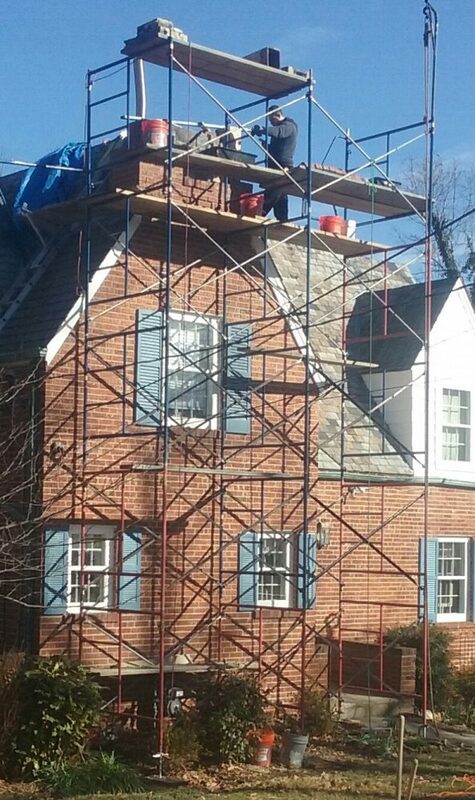 Here is a detailed article about this Potomac, MD chimney repair project. 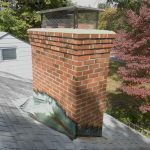 This home had a chimney crown that was crumbled to the point that it was barely there. 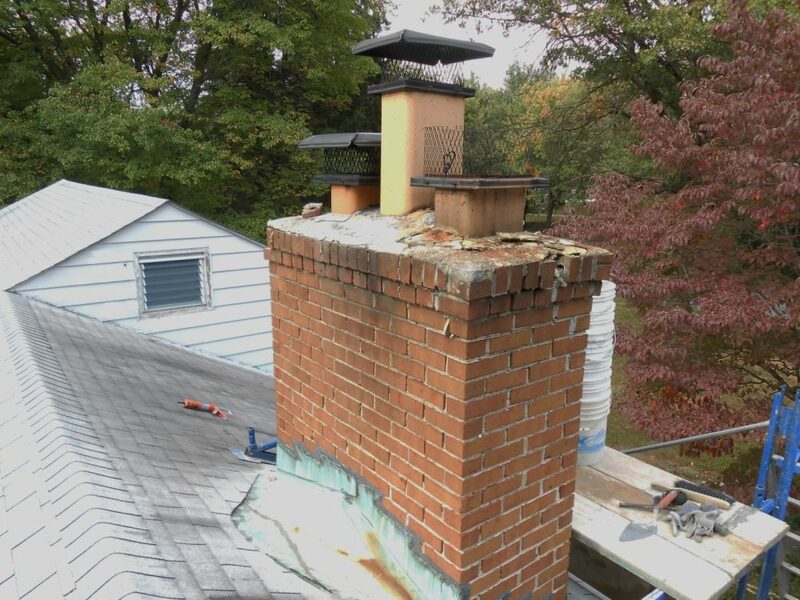 We rebuilt and relined the chimney. 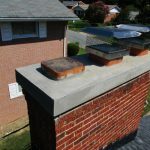 See more about the job here. 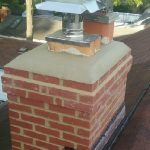 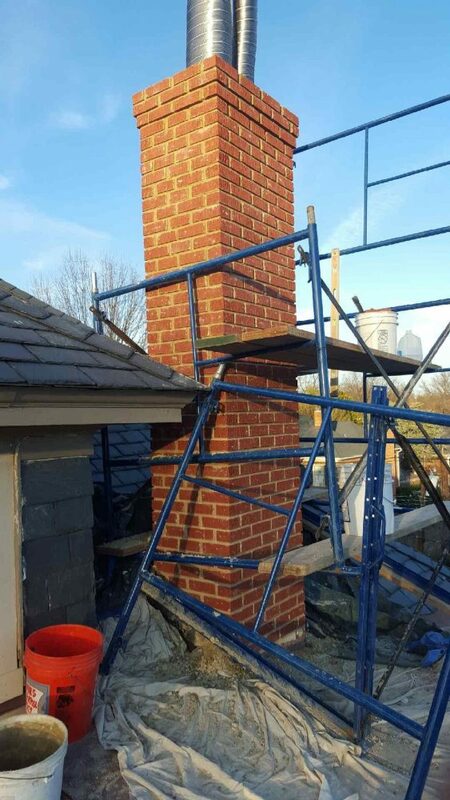 ‘This project combined installing a floating cast chimney crown flue liner replacement and minor repairs to the fireplace. 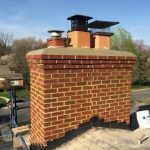 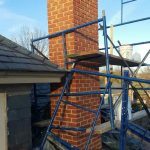 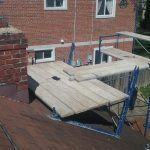 This is a great project to see 3 different stages of chimney repairs. 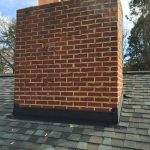 Learn more about this project. 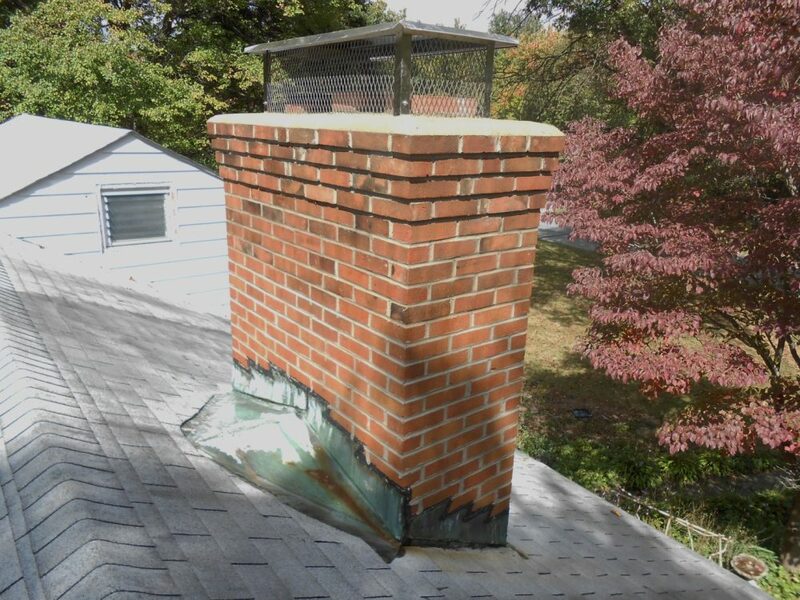 Another company recommended to either tuck point the chimney or reconstruct the stack. 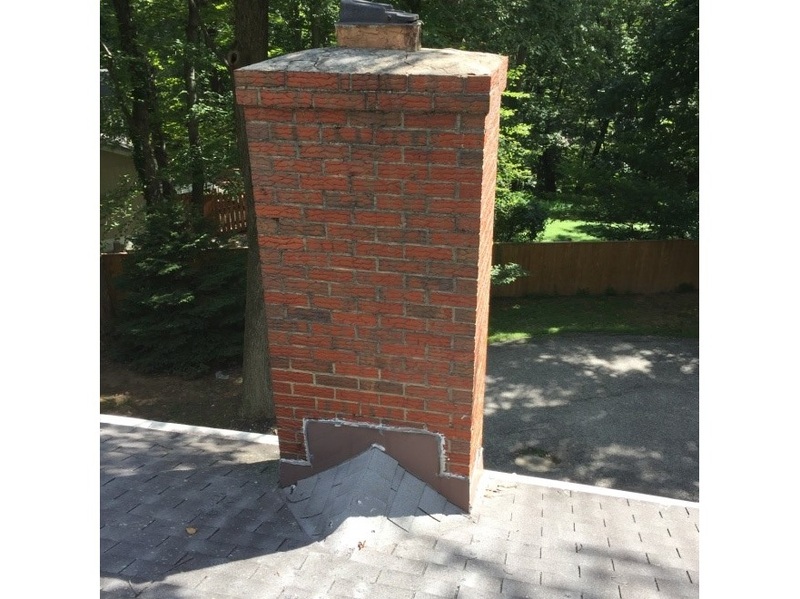 During our inspection of the chimney in Chevy Chase, MD, we noticed the stack had previously been tucked and pointed by another company. 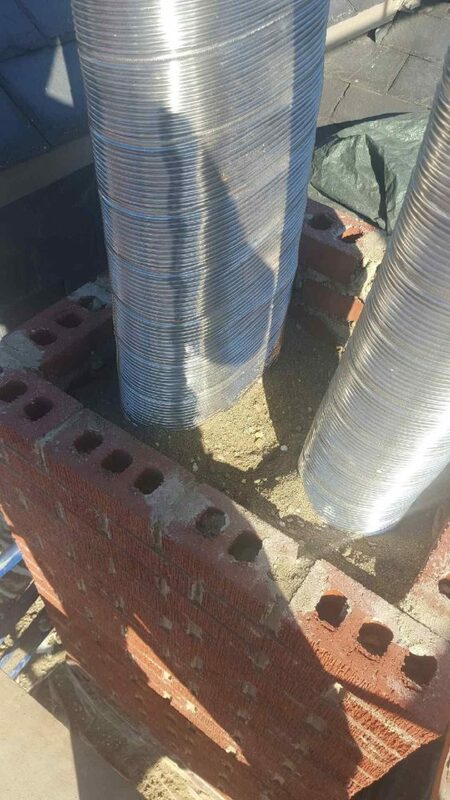 We also noticed that the mortar was no longer binding to the bricks (the bricks were loose) and concluded that tuck pointing it again would not fix the problem. 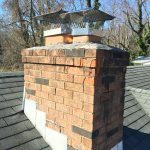 The homeowner agreed with our assessment and decided to move forward with having All Pro Chimney Service repair and rebuild their chimney. 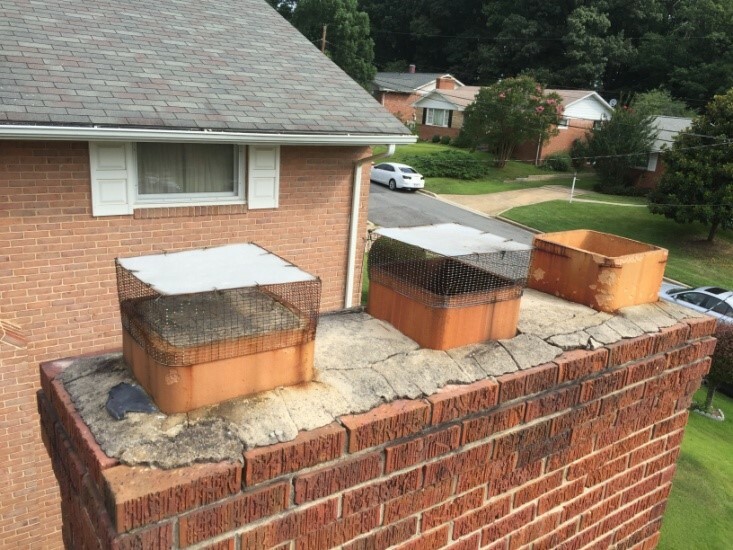 We performed a chimney inspection at home in Columbia, MD and found that the chase was rotten and block foundation had dropped leaving parts of the chase with no support. 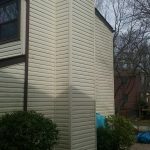 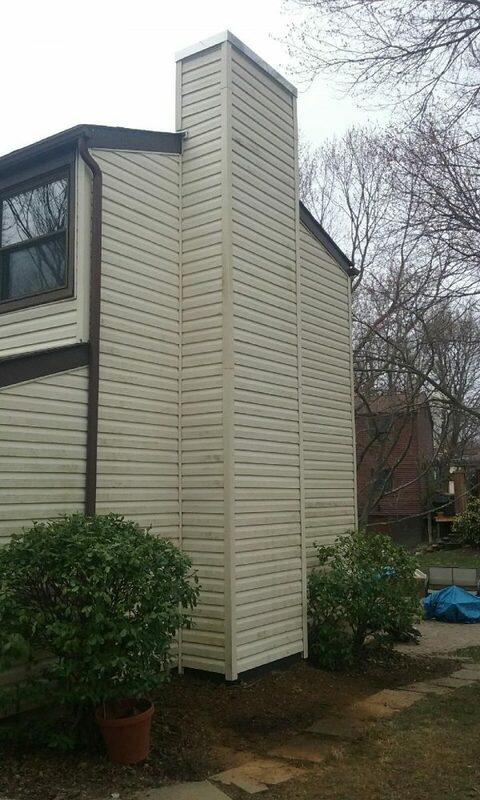 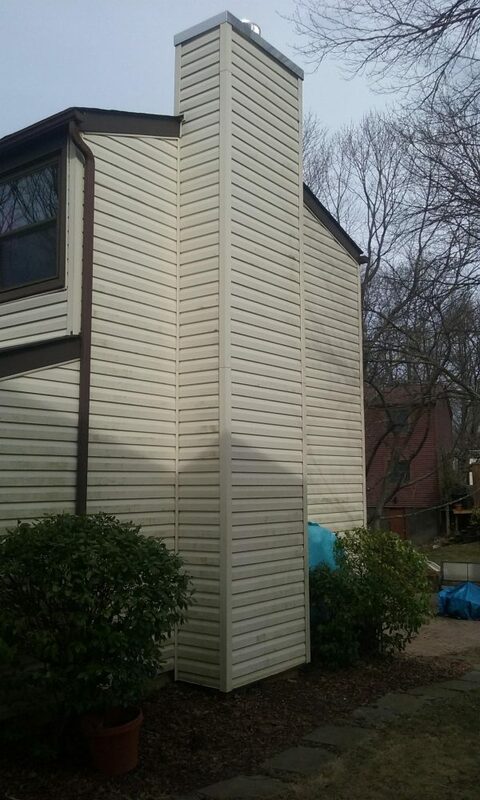 We rebuilt the chimney and reused the existing siding saving the homeowner the cost of replacing the siding. 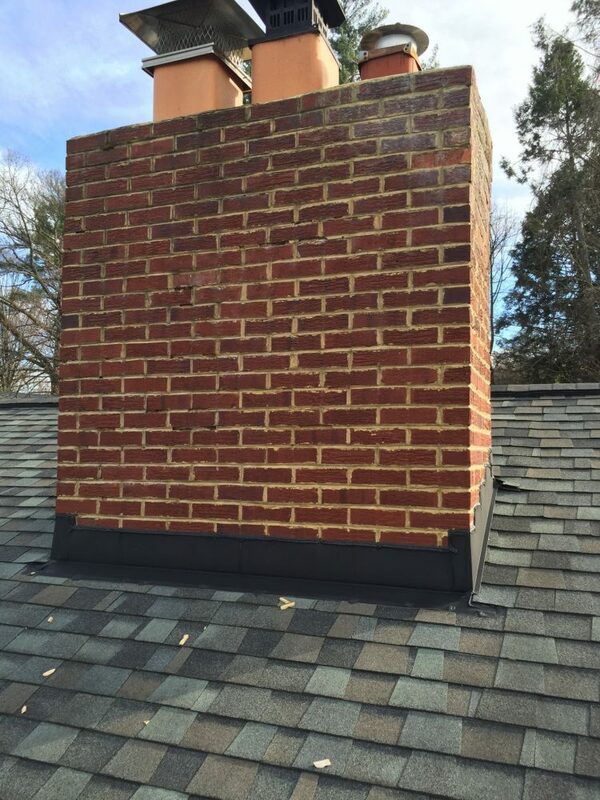 Recent chimney repair project in Annapolis, MD. 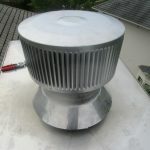 We rebuilt the crown, replaced the top flue liner and installed a top mounted cap damper. 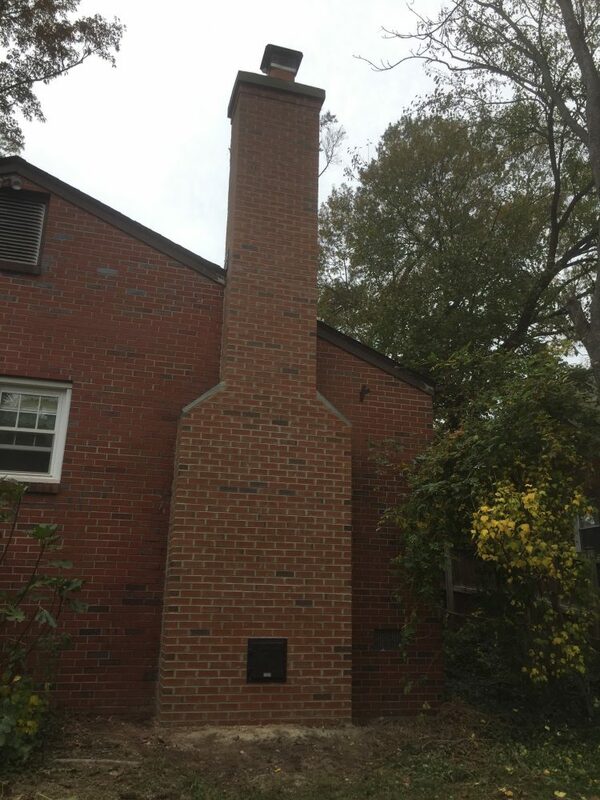 We also resurfaced the fireplace flue and purged the smoke chamber.